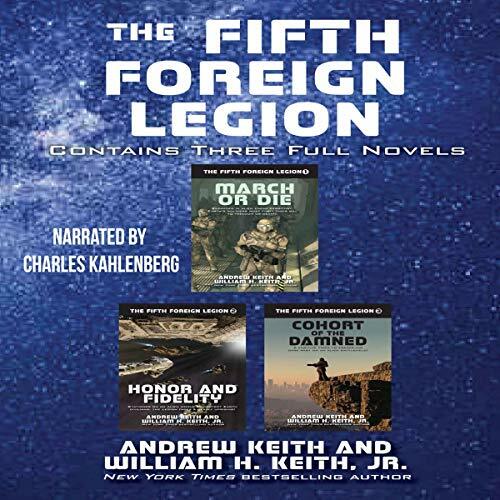 All three grand military SF adventures featuring the Fifth Foreign Legion - on the front lines in the hottest and strangest conflicts in the galaxy. Contains the complete novels March or Die, Honor and Fidelity, and Cohort of the Damned. ©2016 Bill Fawcett & Associates, Inc. (P)2018 WordFire, Inc. The book seems good but the narrator just reads sooooo fast. literally entire paragraphs are one long sentence. most of the time i dont know which characters are talking. he just goes on and on with no breaks. then he slows way down at the weirdest times then speeds right back up. i finished the first two books but each book he seems to go faster and faster and by the third book it gets unbearable. 30min into the third book and i cant stand it anymore. i do not recommend this book because of the narrator.